Aye, ’tis a glorious start to the new week, me hearties. Sun shining through a misty haze. A good breeze ticklin me ruffled cuffs. Fine sailing ahead, I wager. Yes, Moaning Monday isn’t quite worth moaning about, because a new horizon looms ahead. Have you made your goals for the week? I’m writing My Lord Rogue, Lord Simon Danbury’s story, a Nelson’s Tea Novella. In fact, the novella heralds the assembly of the men of Nelson’s Tea with an appearance by Admiral Nelson, himself. News from last week? Though incredibly thrilled by my first appearance on the Amazon bestseller’s list, I’m exhausted coming off the euphoria of Friday’s Kindle Daily Deal. (Special thanks to everyone who bought a 99 cent copy of Duke by Day, Rogue by Night!!! I adore ye all!!!) Because of you, the book ranked #1 in Regency and #1 in Historical for 3 days. Woot!!! At the peak of the day, Duke ranked #5 in Literature and Contemporary Fiction (Stephen King’s 3 books were part of the 4 books ahead of Duke by Day!). And to round out the list, Duke ranked #18 in Kindle Paid Books!!! Arrrrr!!! Color me thrilled!!! But enough about me! Hark, what giftie in yonder window breaks? A couple of giveaways, to be sure!!! 1. A signal flag, me dearies. Here’s the last Kenny Chesney Rum Cocktail recipe I promised ye ~ The Pirate Flag! Pour 1.5 oz. coconut rum and 4-6 oz. Diet Cola into an ice-filled highball glass. Stir briefly. Garnish with lemon wedge. 2. If you’ve still got an IPhone 3GS, I’m giving away an IPhone 3GS phone cover with Duke by Day, Rogue by Night’s book cover on it. All you have to do is post your favorite pirate in the comment section of this blog post. Wishing ye a fun-filled week full of wondrous surprises!!! Great news to share!!! I’m sponsoring a giveaway on Goodreads.com!! Up for grabs? 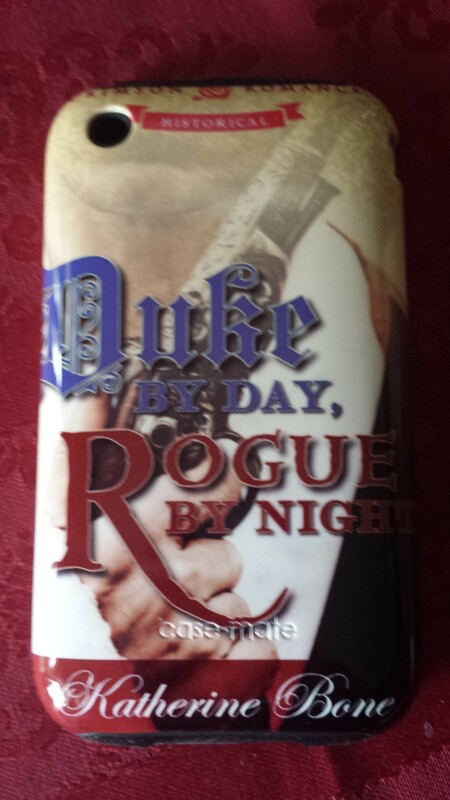 Three signed paperback copies of my debut historical release Duke by Day, Rogue by Night! To date, I’ve got 226 readers signed up!!! I’m stoked and can’t wait to give away my book to 3 lucky readers!!! Meanwhile, I’m staying with darling daughter #1 and helping to take care of her infant son for two weeks. I still owe pictures of my Caribbean getaway and a blog about my trip too. And stay tuned for snippets of my youngest son’s promotion to Sgt!!! Wishing you all a fabulous week!! Life has taken me by storm these past few days. I handed in the galley edits for Lost Treasure, Captive Princess. It’s my first contemporary romance due to release on March 4th. I’d been so worried about that book. Writing contemporary was a bit out of my box, though I had a great time writing the book. Should it be successfully received, I’ve got two more contemporaries plotted and ready to write. Exciting times! In the meantime, I’m on deadline again. The Rogue’s Prize, the sequel to Duke by Day, Rogue by Night and 2nd in the Nelson’s Tea Series is due February 15th. Ack!!! Needless to say, I’ve been very busy finishing the book. This one features Captain Henry Guffald as he tries to restore his naval career. He’s been given an ultimatum, rescue Lord Garrick Seaton, who’s been captured by Spain, or face the end of his captaincy. But there’s one slight problem. A female pirate, on a quest of her own, tries to stop him. What’s a pirate hunter to do? Claim his prize! Busy. Busy. Busy. Life has a tendency to come in spurts of activity and deadlines, doesn’t it? Last night, while writing on The Rogue’s Prize, I realized I had a blog due to the Southern Magic RWA, Romance Magicians’ blog. Imagine my surprise at 11:30 p.m. to learn that I hadn’t written the post yet. Ack!!! As usual, I leave you to sail fair and calm seas!! !